We are very proud to offer our customers local, seasonal produce all prepared in house by our fantastic team in the kitchen. We are fortunate here at Cann Office to be surrounded by an abundance of excellent Welsh food sources and are able to offer our customers the finest food and drink Wales has to offer; from the excellent 28 day matured Welsh Black beef steaks, REAL Welsh hand cooked crisps, award winning Snowdonia Cheese to Penderyn single Welsh Malt & Breacon Gin. We are passionate about serving homemade, freshly prepared, tasty pub food at a fair price and with a smile which will brighten up your day. We aim to make your visit with us an experience you will wish to repeat time after time. We serve fresh homemade dishes with local Welsh sourced ingredients seven days a week. All our menus are based on seasonal produce, subsequently they are reviewed and changed regularly, although our classic and most popular dishes will always feature on our menu. Whatever you’re in the mood for we have a delicious, flexible menu to match your appetite, whether you’re looking for a full 3 course meal or just a snack, afternoon tea or freshly ground morning coffee and cake, we have created a menu to suit all. If you have any specific dietary requirements, please do not hesitate to inform a member of staff and they will be more than happy to help with your meal choice. Breakfast is served to residents from 8.00am in the breakfast room, (earlier by prior arrangement). Breakfast is the first and most important meal of the day and here at Cann Office we aim to create the perfect start to the day. Using local and only the finest ingredients from the superb pork sausages, thick cut shortback bacon, freshly baked pastries and Llaeth y Llan yogurts. What better way to start the day. Come in and relax with a drink in front of the wood burning fire before sitting down to your meal, you’ve a wide choice of places to sit to eat or drink. Part of The Cann Offices’ charm are the small nooks and snugs, character is in an abundance with the old oak beams and the stone and brick walls which have been exposed. There’s a treat for everyone on our dessert menu, watch their smiles and faces light up with one of our Sundaes or our Chocolate Fudge Cake and everyone’s favourite classic Apple Pie and Custard. Whatever your sweet tooth craves we have something for everyone, including Cheese and Biscuits for those who prefer the more savoury option. Our dessert menu changes on a daily basis, depending on what we have made that day, please ask your waitress and she will be more than happy to inform you what we have on offer. Our popular Sunday Carvery is available every Sunday from Midday. 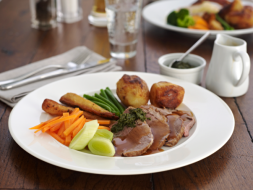 With a choice of 3 delicious locally sourced roast meats with all the usual trimmings as well as a vegetarian option, roast & new potatoes, sweet potato gratin and 6 freshly prepared seasonal vegetables to choose from, satisfying even the most ravenous of appetites. If you have room after that ask a member of staff for our delicious homemade dessert selection of the day – favourites normally include sticky toffee pudding, sherry trifle, apple pie to name a few. Booking is recommended as it does get quite busy. Children under 12 years old main course is £6.95. At the Cann Office we offer a fabulous choice of teas; Earl Grey, Green tea, Organic Redbush, Peppermint and a wide choice of Fruit teas, as well as decaffeinated tea. There is of course a great range of freshly ground coffees, decaffeinated coffees and a selection of liqueur coffees for those preferring something a bit stronger. If you fancy something a little light and sweet mid-morning or afternoon, you need to check out our selection of fresh homemade cakes and pastries. For something a bit special book our afternoon tea with a scrumptious selection of finger sandwiches, scones with jam and cream as well as a selection of savoury nibbles and mini sweet treats, and for those seeking sheer indulgence why not add a glass of Prosecco to really make it special. The Cann Office has retained many of the historical features of a coaching inn. A characteristic pub environment, with hand pulled local ales and working fireplace that creates a warm and cosy atmosphere during those colder months and thick stone walls keeping it cool in the hot summer months. The heart of the Cann Office is the bar, a meeting point for a variety of groups and clubs. Whether your having a drink whilst browsing the dinner menu or warming by the fire after a long walk in the beautiful surroundings or catching up with friends, there is a warm Welsh welcome with a friendly, relaxed atmosphere. 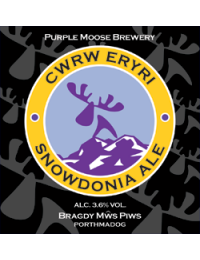 Our well stocked bar and cellars offer a selection of mouthwatering bottled beers and local real ales, sourced from small independent micro-breweries including Cwrw Cader Ales from Dolgellau and Bragdy Mŵs Piws Purple Moose Brewery in Porthmadog. We have lovingly hand chosen a fantastic selection of wines from all around the world, we hope you like them as much as we do. We are passionate about quality over quantity and pride ourselves in stocking a good selection of the finest Single Malt Whiskeys, Small Batch Handcrafted Gins, Château de Montifaud V.S, V.S.O.P and O.X Cognacs as well as a large array of other spirits and liqueurs. A family friendly atmosphere, we pride ourselves on being a family friendly pub with children always welcome, with a large garden and play area for them to let off steam. The perfect venue, a great choice of venue to celebrate any special occasion or host a corporate event. We are able to cater for your special occasion and we are able to prepare and work with you to create a special menu and cater for your individual requirements, just give us a call to discuss your needs and pre-book your table, your room hire or the Marquee which can cater for larger numbers and we will be more than happy to work with you. Butcher- Peter Tomlinson, Llanfyllin, Fruit & Veg- Enterprise Fruit & Veg, Groceries- Harlech Foods, Cheese- Snowdonia Cheese Company, Tea- Morgans Brew, Welshpool, Local Ales- Cader Ales and Purple Moose Brewery, to name just a few. We are always on the look out for local food & drink suppliers – please get in touch with us, we’d love to hear from you.